My March newsletter includes some exciting news about the release of The Dragon Defence League and more! Check it out. 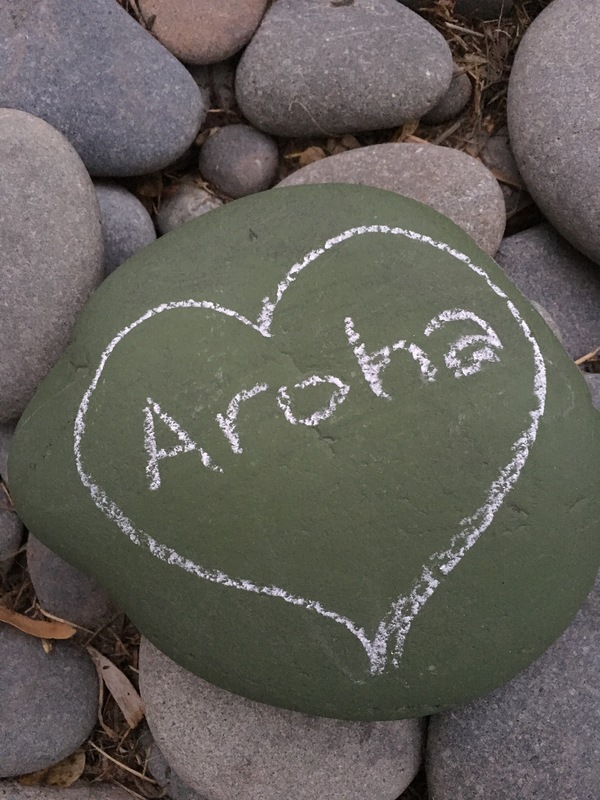 It has been a difficult few days for all of us here in Christchurch. Shock. Horror. Sadness. Fear. Anger. We have been through so many emotions, it’s hard to know what we are feeling at any given moment. But one emotion has come to the fore—love. Even before we understood the full scope of the horror unleashed in our midst, ordinary people were mobilising to help. Within hours, there were community Facebook groups organising walking buddies and rides for those who felt unsafe on the streets. Other pages were organising meals for the families of victims. Donations poured in on multiple Give-a-little pages (when I went to one of them to donate, less than 48 hours after the attack, the total was already well over $3 million). The NZ Red Cross quickly announced they had plenty of blood after being inundated with donors. People from all over the city left flowers at the police cordons outside the mosques. Everywhere, people stood together in love. It’s something Christchurch is good at. We’ve had a lot of practice coming together in the face of adversity in recent years. It’s tempting to focus on this outpouring of support, to acknowledge the love, and reject the attacker as the enemy. It’s tempting to look at the last three days and pat ourselves on the back for how we’ve responded. But no matter how good we are at standing together in adversity, the fact is, we’re not good at standing together in the normal times. We still speak of the Muslim community as though it is separate from the rest of the community. And it is. We need to ask ourselves why. What unacknowledged biases keep us apart? What unacknowledged prejudice prevents us from reaching out to one another in friendship in the good times? Why do we use our differences as an excuse to stay separate, rather than as an encouragement to enrich our lives by learning from one another? Facing these questions may be uncomfortable—the answers will reveal things we may not want to acknowledge about ourselves—but we must confront them. The man who attacked on Friday may not have been a New Zealander, but there is no question the same attitudes are present here. They are fed by our separateness, fed by our unwillingness to stand up against the little things—the racist comments, the perpetuated stereotypes, the marginalisation of those who may look different to ourselves. These little actions nurture hate. Only by vocally and visibly standing together in the good times can we prevent this from happening again. Today, wherever you are in the world, step out of your comfort zone. Reach out to someone different from you—make a new acquaintance, a new friend. Shut down an off-colour joke. Push back against a racist comment. Show your love. Stay strong. Stand together, every day. We nipped out to the beach after dinner on Saturday. We had a nice walk on our lovely, lonely bit of coastline. But the beach was busy with youth hanging out (up to no good, probably). Some were alone, and some were in groups, strutting their stuff. 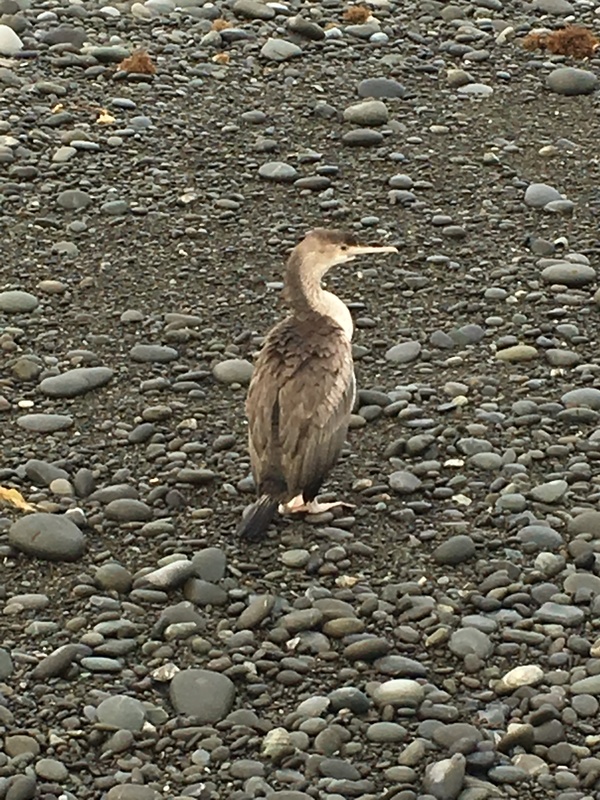 But these youth weren’t your usual crowd of city kids, they were juvenile spotted shags, Strictocarbo punctatus punctatus, also known as spotted cormorants, parekareka, and kawau tikitiki. Shags were once heavily persecuted as pests. Fisherman believed they destroyed the fisheries, snapping up all the commercial fish and decimating their numbers. Research has shown, however, that their impact on fisheries is minimal. On the other hand, there is some evidence that, in our area at least, shag populations are hurt by commercial fishing. Spotted shag populations on the Banks Peninsula rose from 9,787 pairs in 1960 to 22,123 pairs in 1996 following a reduction in commercial fishing around the peninsula. Illegal shooting can also cause local population declines. The spotted shag is a marine species, never venturing far from the sea and feeding in deep water up to 16 km from shore. They’re gregarious, breeding and roosting in colonies with up to 2000 birds. The groups of juveniles on our beach were small—a few dozen birds at most. These birds were probably born on cliffs around the Banks Paninsula, and when mature, they’ll head back to those cliffs to lay eggs and rear their young. So they really were just hanging out on the beach, just like teenagers from Christchurch hang out on the beach on weekends, away from the adults, goofing off and getting takeaways. Late summer is harvest time for all sorts of crops. Nigella might be the most unusual one I harvested this week. Nigella sativa goes by many names: nigella, kalonji, black cumin, fennel flower, nutmeg seed, onion seed, and black caraway. Added to this mess of often misleading names is Nigella sativa’s ornamental cousin, Nigella damascena, also known as nigella (or love-in-a-mist). You could be forgiven for being confused. 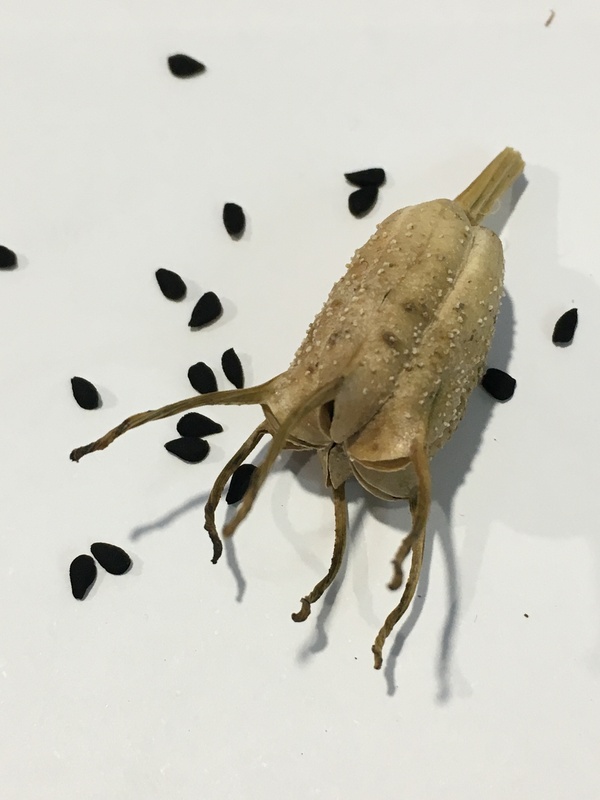 Culinary nigella is a lovely aromatic seed that looks confusingly like onion seed. Its flavour has been described as oniony or oregano-like. I’m not sure how I would describe it—I suppose onion and oregano come close, but the truth is it has its own warm rich flavour. It is traditionally used in naan and string cheese. It’s also apparently great with lentils and other legumes. Because we rarely harvest much nigella, we’ve only used it in naan, where it imparts a lovely savoury note to the bread. But this year, conditions must have been just right for nigella; it grew luxuriantly. Consequently, I have a huge quantity of seeds, so I expect we’ll be trying it out in all sorts of stews and curries. I’m looking forward to the addition to our spicing options. Swannanoa Country Fair–Don’t miss it! Come to the Swannanoa Country Fair on Sunday 3 March from 10 to 3 at the Swannanoa Domain! Enjoy lots of activities for kids (including pony rides and a miniature train). Check out the food, crafts, plants, and other items for sale at over 150 stalls. Learn from a great lineup of talks on topics from beekeeping to cheesemaking to rural security. Pick up your next treasure at a huge white elephant sale. And, of course, enjoy great entertainment, including sheep shearing, duck herding, music, dancing, and a whole lot more. I’ll be there too, with the Christchurch Writer’s Guild. Stop by our tent to say hello and check out the great books on offer from local writers! 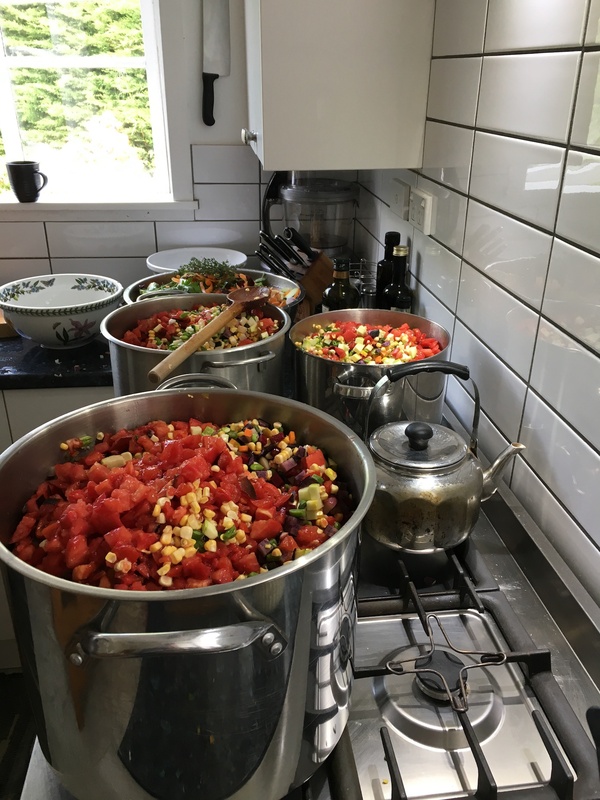 The family made our annual Summer Soup on Sunday. I think we definitively proved we have no self-control when it comes to gardening or cooking. 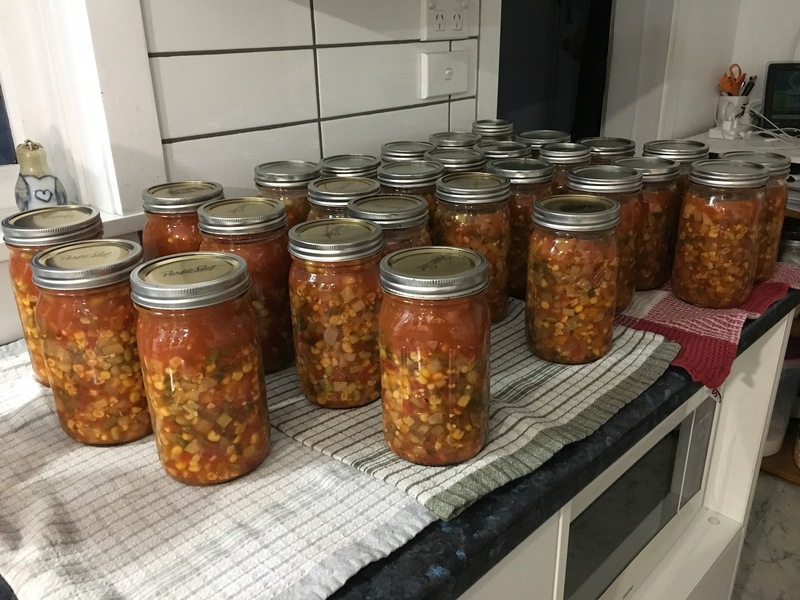 In spite of me reducing my garden area this year, and despite the knowledge that our son is leaving home in a week (and won’t be around to eat this year’s soup), we managed to make even more than usual. We filled all three of our big stock pots, and it took from 7.30 am to 9.00 pm to pick, chop, and process all that soup. We had soup for dinner, I put a meal’s worth of soup in the fridge, and there are 28 beautiful quart jars full of soup lined up in the cupboard. Summer Soup is full of potatoes, carrots, soy, green beans, zucchini, tomato, sweet peppers, hot peppers, onions, garlic, sweet corn, beet root, basil, oregano, thyme, rosemary, and celery. The only thing not from the garden is the salt. It’s a burst of summer goodness for the cold days of winter. It’s a quick and delicious meal when we all come home late. But it’s more than preserved vegetables. It’s a whole-family team building exercise. After a dozen years, it’s a family tradition. Each soup-making session brings back memories of early years, when the kids’ help was more of a hinderance. They took enormous pride in their work those years, reciting the vegetables they’d cut every time we opened a jar. Now they’re both accomplished cooks, and their help allows us to go way overboard on soup-making. They’re less vocal about it now, but I think they’re still proud of their part in Summer Soup. As I’ve mentioned before, anyone can make soup, but it takes a family to make Summer Soup. 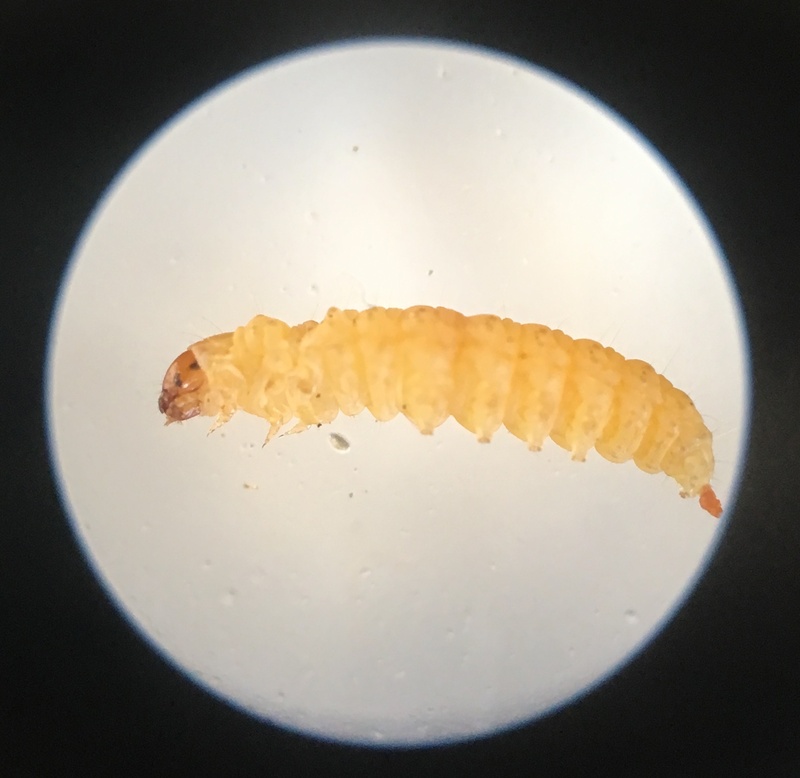 Caterpillar, not maggot–see the six true legs and 10 prolegs? The weather has been hot here, and all the doors and windows stand open all day. With no window screens, that means an array of bugs (and the occasional bird) pops in and out of the house. It’s not unusual to find flies, butterflies, damselflies, etc. on the windows. Still, I did a double-take when I saw maggots on my desk the other day. I knew they hadn’t flown in on their own—they must have been hatched nearby. I checked for unseen dead things on the shelves above, but found nothing. There was another maggot this morning, and I did a second unsuccessful check for the source. Then, while I was away from my desk for fifteen minutes, another appeared. This time I pulled out the microscope and had a closer look. It wasn’t a maggot at all. It was a tiny caterpillar. I could think of no reason for a bunch of caterpillars to be living on my bookshelves and dropping onto my desk. Then I remembered earlier in the day I’d shooed a wasp out of the office several times. The wasp was a European tube wasp. These little insects seek out cracks and holes to nest in. They fill their nests with up to 20 caterpillars as food for their larvae and then seal the nest with mud. That would explain the bits of dried soil that accompanied some of the ‘maggots’. We’ve seen the same thing with our native potter wasps. Last year I had to put tape over all the screw holes in the underside of the dining table, because potter wasps were stuffing them with paralysed spiders (and the spiders kept falling out all over the floor). As I write, the wasp has returned. Empty-handed this time, she’s fossicking around for a new place to raise her young. Maybe she’ll find one her caterpillars will stay in this time.